Fukushima plant operator Tokyo Electric Power Co. claims that an earlier measurement showing a huge spike in radiation levels at the stricken Japanese nuclear complex was ‘a mistake’. According to TEPCO spokesman, water testing showing 10 million times higher in radioactivity than normal was ‘not credible’. Meanwhile, three workers have already been exposed to dangerous materials in the continuing battle to avert catastrophe in the wake of the earthquake tragedy which destroyed large parts of the country. The official number of those killed by the quake and tsunami stands at over 10,000, with many more homeless or missing. 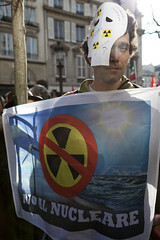 But Fukushima remains the biggest concern – with the ongoing possibility of nuclear meltdown. The effect of the Chernobyl nuclear disaster far outweighs the projected outcome of the crisis at the Fukushima nuclear plant in Japan and the two should not be compared, says Evgeny Akimov, a nuclear engineer from the Chernobyl rescue operation. This entry was posted in All Posts News Politics and-or Videos, Dandelion Salad Videos, Death-destruction, Health, Japan, Nukes, Politics and tagged Chernobyl, Japan 3.11.11 Earthquake Tsunami Disaster. Bookmark the permalink. Of course they are freaking out in there, I wouldn’t want to be anywhere near it! Imagine the stress. This thing is nowhere near out of the woods, on the brink at all times, dependent on workers risking all for the folly a bunch of deranged nuclear idealogues. There was just another huge earthquake in the same spot, if somehow progress is thrown off cooling those rods, things could change very fast. I hope they heed Michio Kaku & get ready to sandbag that thing, and everyon else should clear out of there at least 100 miles away. Whatever crazy industrial things people do, stay away from nuclear energy!